This time of year my eyes find the leaves. Just like the people who go to Gatlinburg in the fall and every amateur poet who’s ever lived and I think maybe just about everyone else. We’re all in this together! I am reminded that all is transitory and transforms, no matter how much we might wish otherwise. Today’s Bacon features leaf photography from my yard plus a terrific photo essay by my friend Carolyn Taylor, who had the chance to see some flora and fauna very far away from hers.I hope our photos might gladden your eyes for a moment today! I am so grateful for the generous community of Bacon readers and contributors. Not exactly leaves but I did pick these flowers from the cooler at Import Flowers on Murphy Road and the light hit them just right and they made me happy. It occurs to me in hindsight that every single one of these photos is about – light. What our eyes can see in the right light. And I’m thinking that decay might be about what’s passed but also might be ever and always looking forward toward a brightness, a greater light. My photo essay highlights a few of our favorite moments from our trip to South Africa in July. 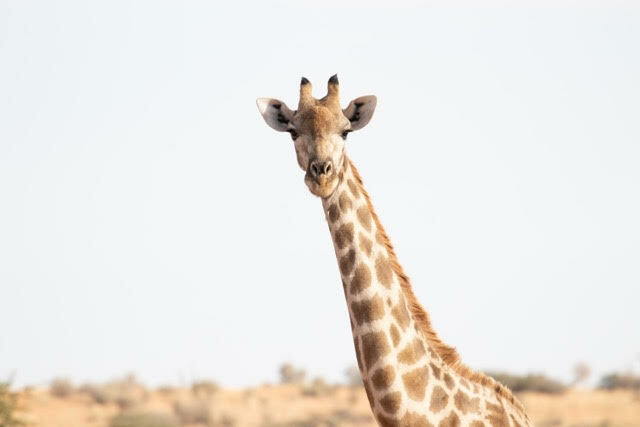 It is hard to convey the beauty of the animals during the day and the splendor of the African “diamond sky” at night, but I hope that these photos give you a taste of this incredible country. 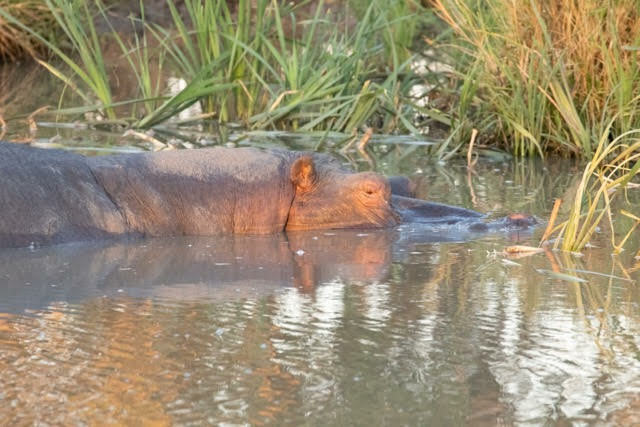 We visited conservation reserves only, and are grateful for those who created and maintain them for the benefit of the animals who live there. 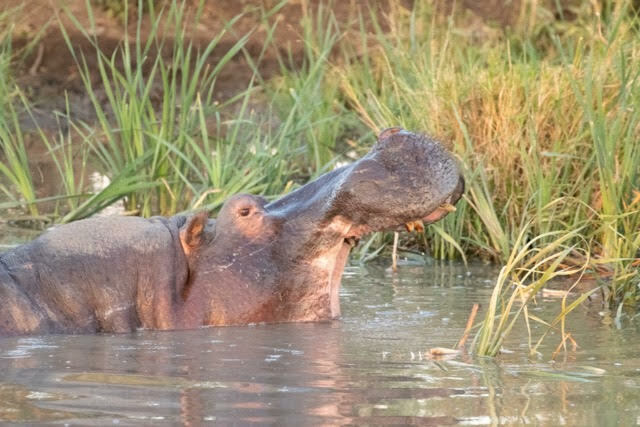 When it is your first day on safari and your cute guide Francois tells you to get out of the Land Rover and lie on your stomach 15 feet away from a pack of wild dogs eating a warthog, go ahead. It really will be ok! I didn’t believe this at first, so I sat (ready to run!) as the rest of my family quickly lay down. The wild dogs are organized and work as a family. One or two stay at the den to care for the puppies while the rest go hunting miles away and bring food back. And even though they ran around us looking vicious and chasing away the jackals, we were totally fine. I thought I was an observant and detail-oriented person until I met William and Equalizer. These incredible gentlemen were our trackers in Kalahari and Sabi Sands, respectively. A sandy road was a story that they could read, but I couldn’t. They could identify which animals had crossed the road, and when (this morning, last night, yesterday afternoon), and in what order. 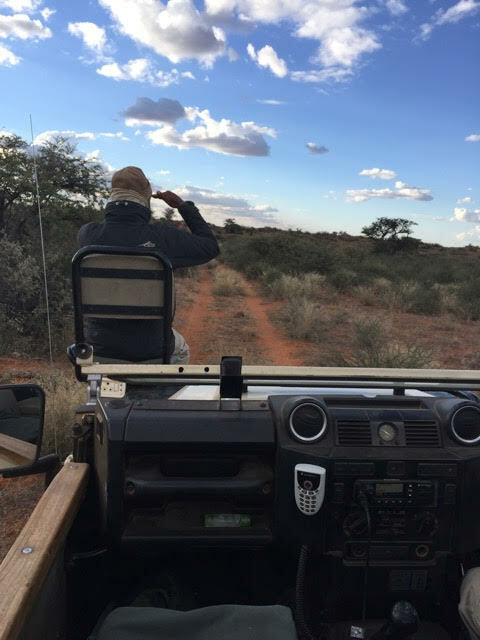 Sitting on the front of the Land Rover in a jump seat, scanning the ground as we drove, each would alert us to nearby animals with a quiet raise of his right hand. They will let you know how they feel. He’s saying “Go away now!” So, we did. Some look like they should live in the jungle rather than the desert. Some are beauties with rainbow colors. 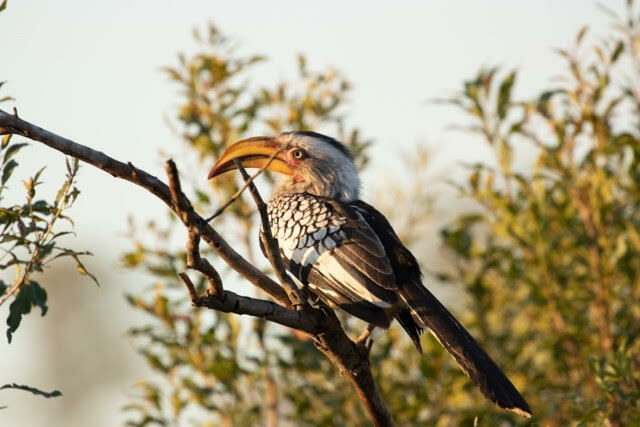 Some have community nests – the largest built by any bird on earth. 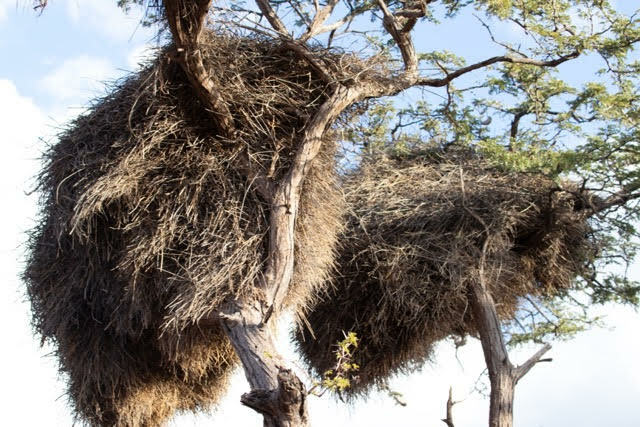 This is a sociable weaver nest for about 100 birds of many generations. And some can’t make it to the trees because they don’t actually fly. 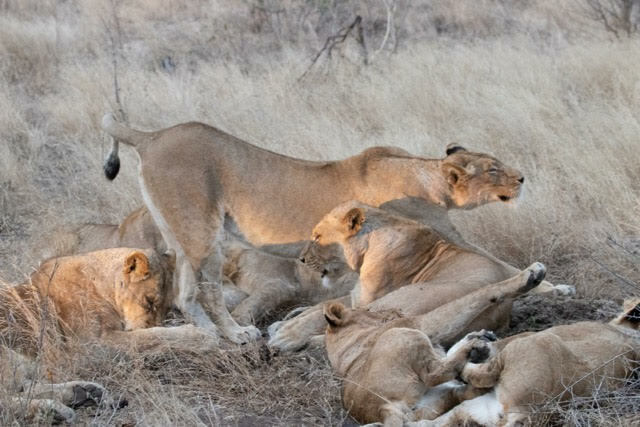 The lions sleep like content kittens – they pile up on one another and lie on their backs without a care in the world. When you sit at the top of the food chain, sleep is easy. When they wake up at dusk, they stretch. Don’t be fooled! After these lions woke up, they went hunting. Our amazing guide Greg correctly guessed where they would go, driving ahead of them and and then turning off the engine and the lights. We sat in the dark, in silence, waiting. Later, Equalizer turned on the lights, and they were all around us… eleven of them. It is unsettling to have lions hunting around you in the dark. There was a roar, a shriek, and they had caught an impala. We watched them eat it and learned that the lions are nothing like the wild dogs that work together and take care of each other. It is each lion for him or herself. One held another in a headlock, others played tug-of-war with parts of the impala, and the rest snarled and swiped at one another with their huge paws. Eleven lions fighting for food just feet away from our Land Rover was an immense display of ferocious power, and we will never forget it. They aren’t cute when they are doing that, they are terrifying. Greg and Equalizer kept us safe, though, and we trusted them. We were reminded to respect and cherish the wildlife around us. We learned that seeing wild animals is the motivation my children needed to rise before dawn. (They were dressed and in the Land Rover before us every day.) We confirmed that there is no substitute for seeing and learning about other countries and cultures – it makes earth a smaller place and brings us closer to the people and the places in the news stories from around the world. And – a “sundowner” vodka and tonic in the bush tastes better than one at home. Photo credits go entirely to my children. Beautiful photos and great write up on what sounds like an incredible trip. Two wonderful photo essays. I loved learning from Carolyn about the sociable weaver. (That nest?!) And, Jennifer, your thoughts on decay resonate. So thankful this holiday for the joy of reading. I really enjoyed this post and the photos! Carolyn’s description of the lions echo what I learned from a friend who recently traveled to South Africa as well.